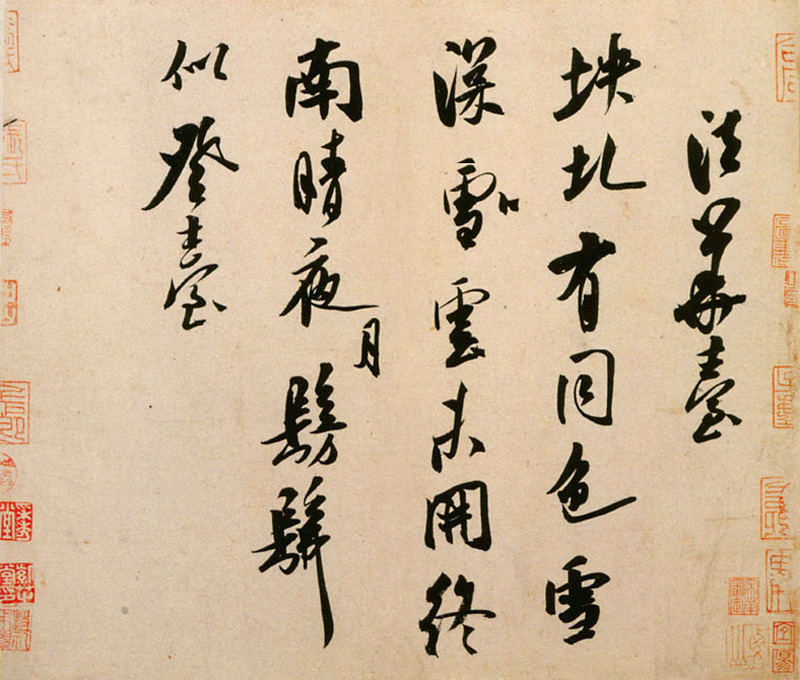 Mi Fu (米芾, 1051–1107) was a Chinese painter, poet, and calligrapher born in Taiyuan, Shanxi during the Song Dynasty. Because his mother had been the wet nurse of the Emperor Yingzong (reigned 1063–1067), he was brought up within the imperial precincts, mixing freely with the imperial family. 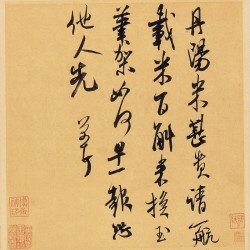 As a young boy, Mi showed precocious talent, particularly in calligraphy. 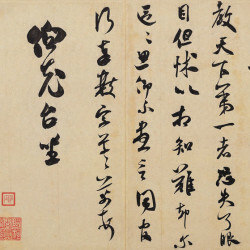 Although he expressed distaste for the formal lessons prescribed for a future official, he displayed a lively intelligence in his quick understanding of learned argument, his aptitude for excitingly original poetry, and his ability in painting and calligraphy. In later life Mi Fu had a checkered official career, with frequent changes of post. He began as a reviser of books in the imperial library and subsequently served in three posts outside the capital of Kaifeng, in Henan Province. In 1103 he was appointed a doctor of philosophy and was briefly military governor of Wuwei in the province of Anhui. 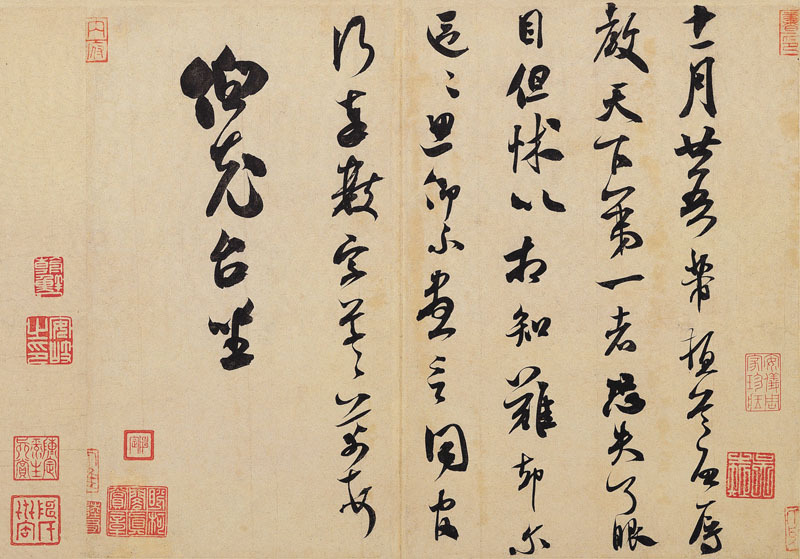 He returned to the capital in 1104 to serve as a professor of painting and calligraphy, taking this opportunity to present to the emperor a painting by his son, Mi Youren. He then undertook the position of a secretary to the Board of Rites before setting out on his final appointment as military governor of Huaiyang, in Jiangsu Province, in which post he died at the age of 57. Mi Fu was married and had five sons, of whom only the two eldest survived infancy, and eight daughters. 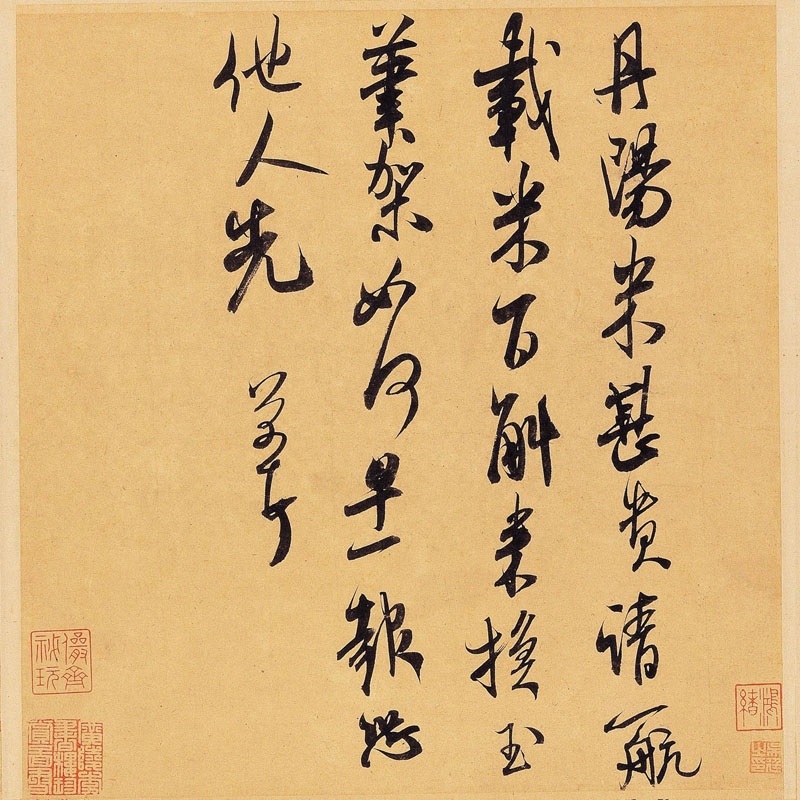 Mi Fu believed in respect for historic styles suffused with the calligrapher’s own creative talent. Most of all he valued spontaneity and self-expression, eschewing the contrived and saccharine. Throughout Mi’s life, the workings of a highly individualistic temperament were evident. This was manifested in his fastidious attention to cleanliness, his preference for the clothes of ancient Chinese dynasties, and his love for strange rocks and ink stones, which he collected. 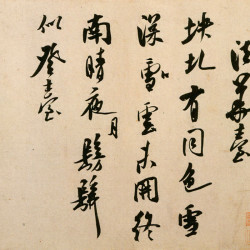 Mi Fu was noted as an eccentric, or “Madman Mi (米癲)”. He was so obsessed with collecting stones that he even declared one stone to be his brother. Hence he would bow to his “brother” in a display of the filial devotion given to older brothers.